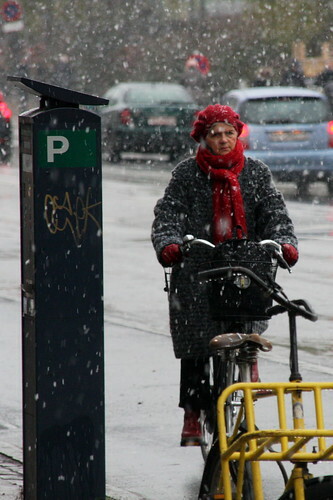 Of all the cyclists I shot on this stretch she was the only one without her head down squinting into the driving snow. Fantastic grace and style. And this Copenhagener is still going strong. As is this dapper gent. 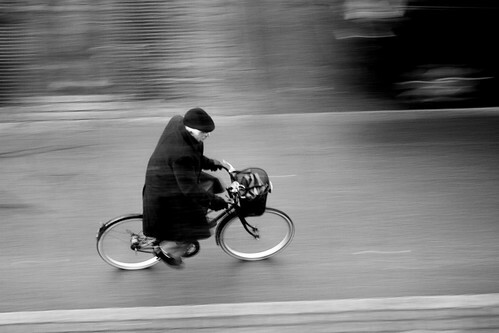 It's a fact: Old people on bicycles are awesome and heartwarming. Now THAT'S what I've been missing here! 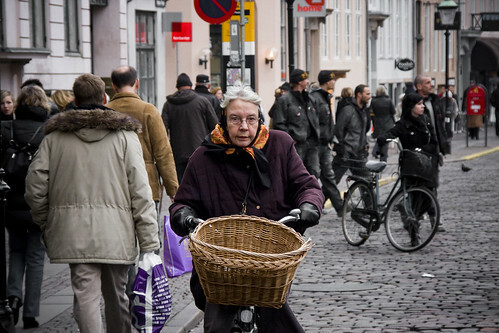 That's something I loved about the Netherlands: people of *all* ages, *all* stations in life, just biking around the same way they would walk to get places. Glad you put up these shots! When we arrive at Dupont Circle, Old Lady debarks along with me and disappears in the crowds. Now, myself, I don't like just standing on escalators like most people, and walk, or often bound up two steps at a time. (In Washington – a nice thing – people stand on the right to let others pass on the left.) So, once I get to the escalator, I start moving up the steps at a brisk pace, passing the multitudes standing inertly to the right. Part of the way up, who do I meet but Old Lady, herself *walking* up the steps, using her body the way nature intended. Just seeing her there like that made me feel wonderful! Go Granny!!!!!!!! As a specialist in Geriatric Physical Therapy I gotta give it to the old folks on bikes!!!!! This is lovely. Hard to tell the age of the first cyclist in the snow, but she looks about my vintage (boomer). Kiwehtin, I don't know where you cycle in Montréal, but when I head to Marché Jean-Talon, at fifty-something I am never the oldest cyclist there. Lots of us about my age, but older people too. I do find it sad that while there are many Italian immigrant men who must be pushing 80 on their cycles, I rarely see their wives doing so. Those men also wear flat caps and dress well. It may be normal to dress more casually when you no longer have to follow an office dress code, but it is disenheartening when people give up and always dress as if they are doing heavy yard work. Thanks for these images. I just turned 47 this week; still a youngster I suppose, but seeing my elders on bikes, living an active life, and dressing up a bit, reminds me of what I look forward to about growing older. It's not something that I dread the way so many people, especially women, do. I see myself increasingly simplifing my life, my clothes, re-evaluating my needs, eliminating the junk and choosing quality over quanity and bling. All the while on my bike, by the way. .....unless they're riding a bike, in which case out comes the lycra, head to toe. And a big thanks to the creator of this blog for opening my eyes to the ridiculousness of the whole 22 speed and plastic clothing fetish~ian.